Neural issue 55 / Autumn 2016 has published a review of Artificial Aesthetics. Over the years, Miguel Carvalhais has developed a consistent practice producing music compositions, graphic design, live audiovisual performances and sound art installations. Furthermore, this practice is accompanied by academic work teaching and publishing. 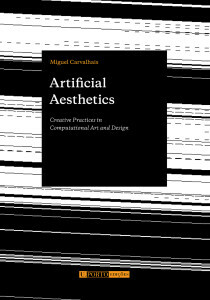 Artificial Aesthetics manifests all of the aforementioned work in a single, coherent articulation around the fulcrum of his research: the aesthetic qualities of programmable media. The autonomous quality of programmable media emerges as a key factor in Artificial Aesthetics and the author goes through an attentive historical analysis of the processual systems for its creation, from the recombination of elements to various degrees of artificial intelligence. Here Carvalhais is developing an analytical model for the analysis of procedural systems. This is arguably a new methodology, but one with the concrete potential to become a standard. One of the most valuable aspects of this book is how every single chapter includes relevant content emerging across specific visual, audio and textual artworks, all of which are drawn together in a coherent presentation. The “artificiality” of processes is constantly referred to when the author qualifies elements with or without acknowledgeable human qualities. As Carvalhais brilliantly defines it, we are still in the historical phase of “computational incunabula”, already with a substantial history behind us. This book can potentially become a classic, but it already looks it could become an essential reference for digital art and culture in the future. Cage from Arm on Vimeo.